Our services include Ultra Cold Freezer repair, incubator repair and centrifuge repair. General lab equipment repairs are our speciality! 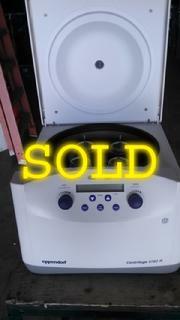 We have some pre-owned and used lab equipment for sale. Please contact us with the type of unit you need; if we do not have it, we may be able to locate it for you. Routine processing such as sample preparations, pelleting, extractions, purifications, concentrations, phase separations, receptor binding, and column centrifugations. Processing large numbers of small-volume samples in multiwell plates for concentrating tissue-culture cells, cloning and replicate studies, in-vitro cytoxicity studies, receptor binding, and genetic engineering experimentation. Rapid sedimentation of protein precipitates, large particles, and cell debris. Binding studies and separation of whole blood. The Centrifuge 5702 is a non-refrigerated , the Centrifuge 5702 R a refrigerated, and the Centrifuge 5702 RH a refrigerated and heatable bench-top centrifuge for use by trained professionals in routine, training and research laboratory work in the biosciences, industry, hospitals, and the chemistry field. Its varying rectangular buckets, round buckets and adapters make it specially well suited to centrifugation of blood sampling systems, Falcons® and centrifuge tubes. Fixed-angle rotor F-35-30-17 with a capacity of 30 x 15 ml centrifuge tubes. Fixed-angle rotor F-45-24-11 with a max. capacity of 24 x 1.5 / 2.0 ml in micro test tubes. Fixed-angle rotor F-45-18-17-Cryo with a max. capacity of 18 x cryotubes (max. ∅ 17 mm). Swing-bucket rotor A-4-38 with a max. capacity of 4 x 85 ml in round buckets and 4 x 90 ml in rectangular buckets. Swing-bucket rotor A-8-17 with a max. capacity of 8 x 15 ml. The Beckman J2-21 is a floor model centrifuge designed for easy operation. The instrument combines unparalleled safety and superior functionality. 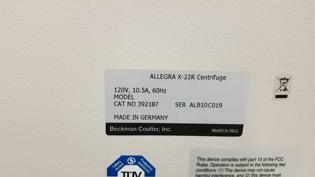 Constructed to improve workflow and productivity, the high-speed Beckman J2-21 centrifuge has a performance speed of 21,000 rpm. 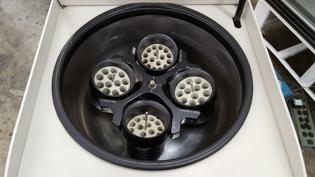 The Beckman J2-21 high-speed centrifuge is virtually maintenance-free. 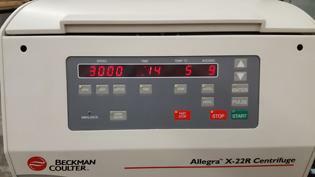 With its indirect drive system feature, the Beckman centrifuge runs with highly improved acceleration and deceleration. This leads to less wear and longer brush life of the centrifuge. Other superior functionalities of the Beckman J2-21 include imbalance detection, auto temperature compensation, selectable braking modes, auto overspeed compensation, and built-in diagnostics.